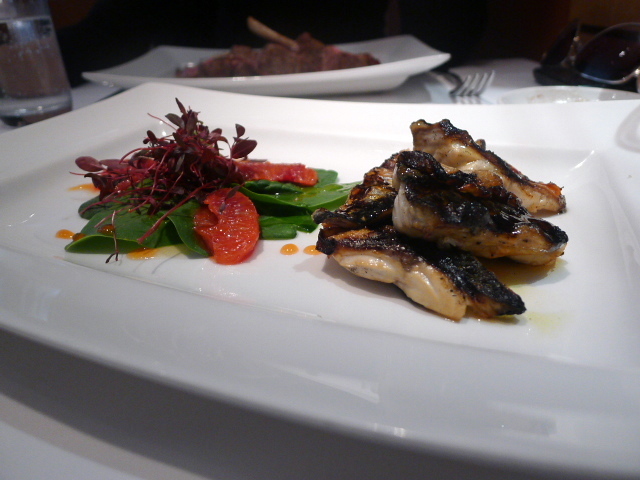 Enoteca Turi is a family-run Italian restaurant in Putney which specialises in regional Italian cuisine. Opened by owner Giuseppe Turi in 1990 (hence the name), this restaurant is still going strong after two decades, and can be considered something of a Putney institution given the proliferation of chain restaurants which have emerged on the High Street in recent years. Giuseppe can still be seen walking around the restaurant floor, and you know pride and care has been placed into every detail of the restaurant. I have eaten at Enoteca Turi before and enjoyed the food very much. This time around I dined as a guest of the restaurant. A classic Venetian dish of smoked haddock mantecato (£7.75) was lovely. Similar to a pâté blended with a little olive oil, it wasn’t particularly smoky, but the fish flavour was rich and distinctive. 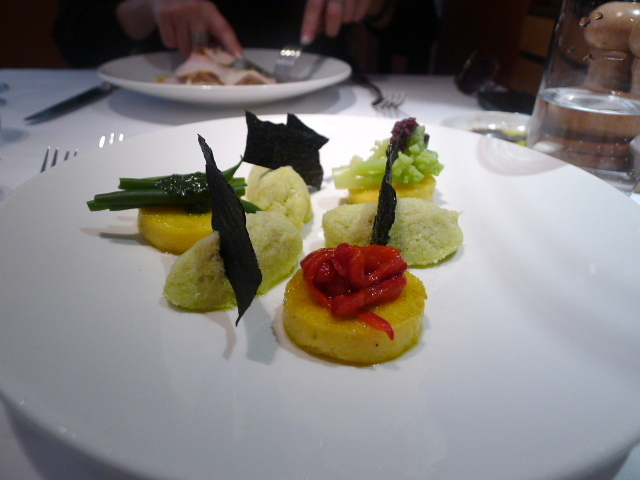 It was accompanied by a trio of polenta crostini with pepper, cauliflower and green beans topped with polenta crisps. The polenta crostini was a little dull, but the red peppers were sweet, and the cauliflower and green beans were cooked al dente. The beans had been finished with a drizzling of some fantastic homemade pesto. Enoteca Turi offers a good value set lunch menu with two courses for £16.50 and three courses for £19.50. There are three choices available per course. We selected our second starter from this menu, a millefoglie of pork belly. 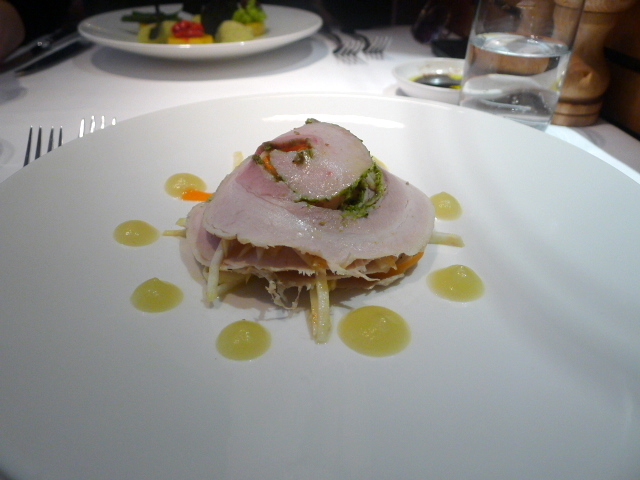 A dish of thinly sliced layered pork, it was impressive to see it as part of the set lunch offer as the pork was excellent. The lightness of the accompanying celeriac, carrots and apple sauce worked winningly with the pork. 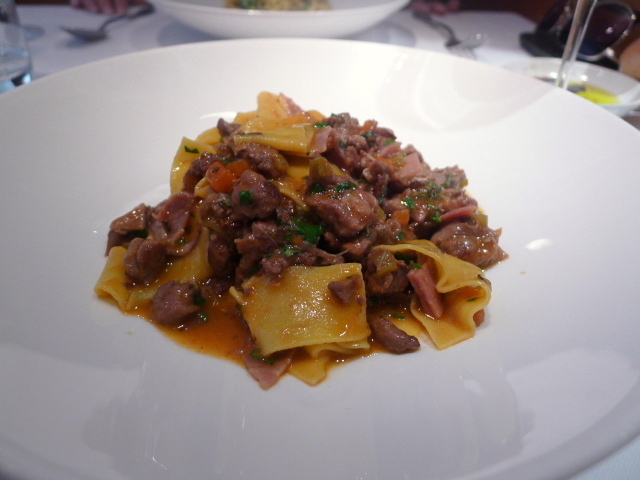 A pappardelle with duck ragout and prosciutto simmered in red wine and herbs (£11.75) was divine. Rich and boldly flavoursome, the pasta had been expertly made. My companion, ‘the blonde’, loved it. 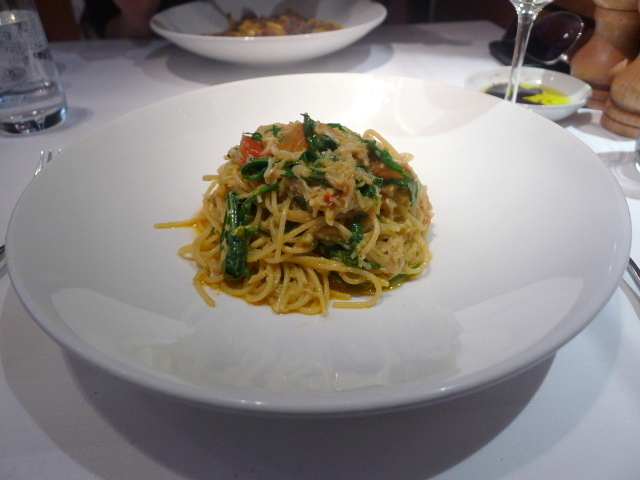 Fedelini, a thin spaghetti, with fresh crab, tomato, chilli, garlic and rocket (£14.50) was tasty and enjoyable. The pasta was again expertly made, although the dish would have worked slightly better with a touch more chilli and garlic. A fillet of mackerel matched with a blood orange and baby spinach salad (£10.50) proved to be an excellent combination, with the sweetness of the orange accentuating the fish (the dish normally comes with fennel as well but we requested it without). The mackerel was fresh and flaky although the skin tasted slightly burnt. 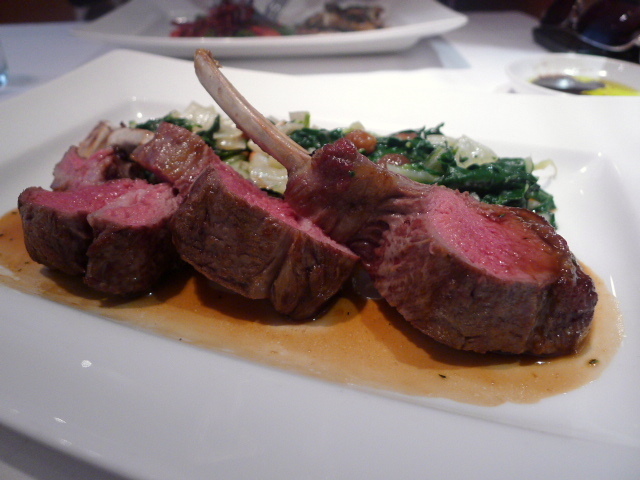 A roast rack of lamb (£19.50) was incredible. Flavoursome, and meltingly tender, it sliced like soft butter. It came with a Swiss chard caponatina with pine nuts, raisins, capers and olives. This was well cooked with a little bite to the chard, but the olives were very salty. Still, the dish won me over with the amazing quality of the lamb. 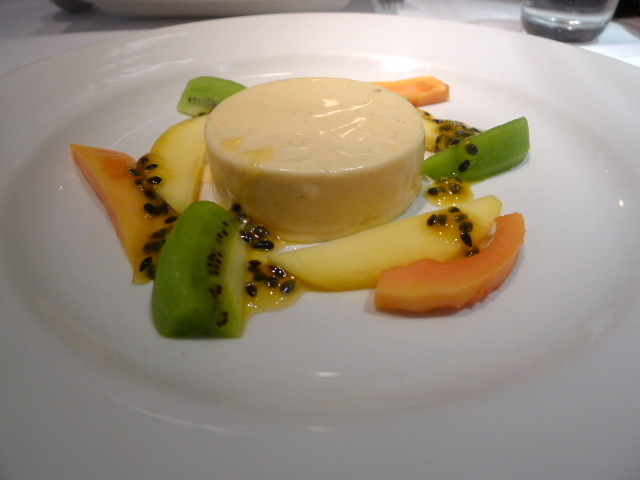 A blood orange panna cotta with tropical fruits (£7.25) was delightful. You couldn’t really detect the blood orange in it, but the texture was creamy and sensuous, and there was a good strong vanilla flavour in the panna cotta. The acidity in the fruit was a nice finishing touch in the dessert. 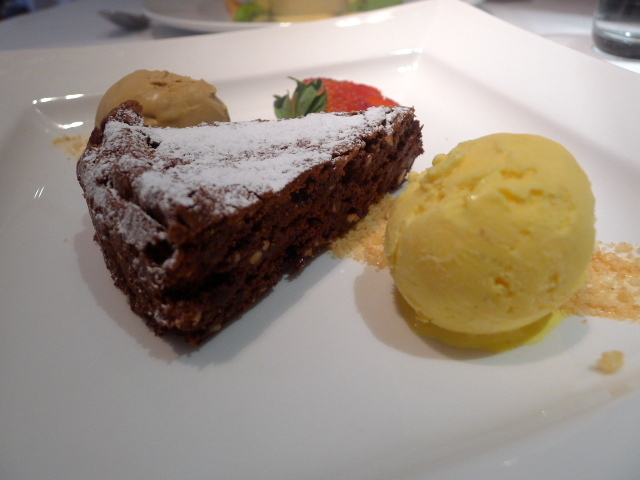 A good dessert of hazelnut and chocolate cake (£7.25) was nutty and crumbly. We ordered an extra scoop of vanilla ice cream to go with it, and this worked better with the cake as the usual accompaniment of coffee ice cream was a little powerful against the richness of the chocolate. The service was friendly, although oddly no one seemed to want to bother with our drinks orders. We got overlooked a few times in this department, which was surprising as Enoteca Turi prides itself on a fine collection of Italian wines, and all the dishes on the menu are matched to a glass. The food was excellent and highly impressive. This wasn’t basic suburban fare. Instead it was far classier than that. Refined, well presented and expertly prepared, I enjoyed this meal very much. The portion sizes were also generous. For the price, quality and flavoursome dishes, this is a choice Italian restaurant. Price range: £23 – £37 for three courses. There’s also a good value lunch menu with two courses for £16.50 and three courses for £19.50. Excludes drinks and service. Sounds like a great option for pasta cravings. Thanks for the heads up. Glad you like the food at Enoteca. No doubt you would have liked the wine list. Yes, if you do get the chance try it out! I have found good Italian to be difficult to find in London. I feel it is either bank breakingly expensive or just not that good. This however looks fantastic and doesnt seem to pricey for the quality. I cant wait to try it. Thanks for the recommendation. I hope you enjoy it when you try it out. Let me know what you think. really enjoying your blog – and so pleased to see Enoteca Turi here, it’s reminded me that it’s been too long that I’ve not been there and you’ve inspired me to invite my sister on a ‘date’ there as she is a big fan too from when we both used to live in Putney. Glad you are going to go try Enoteca Turi again. I think it is a really nice little Italian.